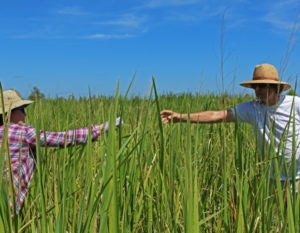 The GCE-LTER team passes water samples within the SALTEx marsh. On the banks of the Altamaha River there exists an experiment that can be seen from the satellite image on a Google map: SALTEx. Porewater salinity (the salinity of water contained in the soil) is increased permanently by literally pouring saltwater over the plots to replicate sea level rise. Porewater salinity is increased temporarily to replicate drought. No action is taken so that the plot acts as a control. Saltwater sites at SALTEx show obvious vegetation dieback. Walking along the narrow boardwalk, I saw the tags that clearly labelled each of the plots. A few did not need markers: where saltwater had been increased permanently, all plants had already died, leaving nothing but mud and a few crabs behind. These plots are both a warning and a look into a potential future: if saltwater inundation becomes permanent, the productive salt marsh habitats will completely die back, leaving only mud in their place and changing both the visual characteristics of the coastline as well as its wildlife. Based on the four treatments mentioned above, scientists are hoping to gather a lot of useful data. Will relationships between plants and wildlife change with more salt or freshwater? Will the community of plants change? How will levels of nutrients like nitrogen and carbon change? While smaller-scale studies have been conducted in the past, none are as comprehensive and long-term as SALTEx. I live along the coast, so SALTEx could be a valuable tool to tell me how my home landscape might change as sea level rises and alters the levels of saltwater in coastal marshes. A small placard denotes the treatment for each plot. Just standing amidst the cutgrass drives home how important they are for both humans and wildlife. These wetlands provide habitat for insects (like giant caterpillars), mammals, and fish, all of which contribute to the health and bounty of the coastal environment. 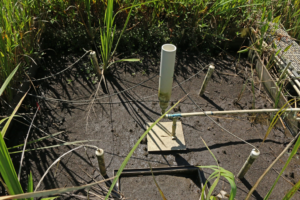 Marshes also enhance water quality by filtering out sediment and chemicals, and also protect inland areas from storm surges. Coastal marshes and the many benefits they provide are likely to undergo significant changes in the coming decades. 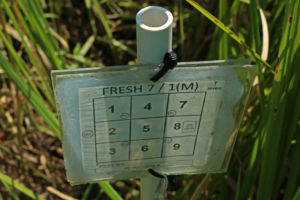 Luckily, projects like SALTEx are helping predict how they could change, and what the consequences will be, so we can help maintain key marsh habitat into the future. I know I’ll be following the study very closely!